The wine appellations of Monbazillac and Saussignac are two of the most picturesque and unspoiled wine regions in France. Located in the Southwest of the country, they make an easy day trip from Bordeaux or Bergerac and for dessert wine fanatics, a visit there is a must. The undulating vineyard covered hills are spotted with dreamy farmhouses and occasional châteaux and the wines are as uplifting as the landscapes. The grapes grown here include Sémillon, Muscadelle, Sauvignon Banc (like the Sauternes blend); along with Chenin Blanc and Ondec. Monbazillac’s vineyards are ancient, originally dating back over 900 years on the hill of Mount Bazailhac. The delicious sweet wines are attained by Noble Rot, as in Sauternes. The honeycomb and acacia wines can last for decades and are the perfect foil for local Dordogne gastronomic specialties like silky Foie Gras and Confit de Canard. On this private chauffeured wine tour of the region, you will visit three contrasting estates, ranging from an imposing castle to a historic manor to an organic family-run estate. Lunch is a major highlight and will be prepared by one of southern France’s best female chefs and served on a terrace overlooking a spectacular vineyard- blanketed valley. Apart from the flagship dessert wines you will also taste excellent examples of dry red and white wines, and learn about the region’s passionate organic wine movement. This is a fantastic day excursion for wine lovers in the Southwest of France. This morning, your personal chauffeur and accompanying wine guide will collect you at your hotel or villa in Bordeaux, Bergerac, Sarlat. 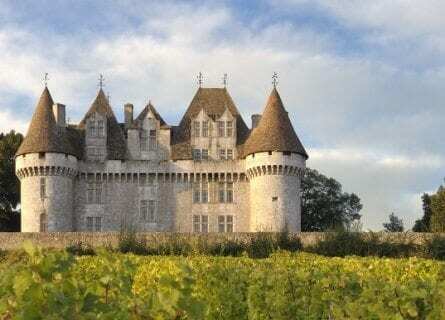 Travel through pretty vine-lined narrow lanes to the beautiful 16th century Châteaux de Monbazillac. Pop into their wine museum which features not only wine history but also the story of Protestantism in the region and an exhibition on the thousand castles of the Perigord. Taste an array of honeyed Monbazillac wines, not a bad way to start the day! Carry on to your next estate, dating back to the Hundred year war and in fact built by the British. Tour the vineyard with the owner himself and finish off with a tasting of their wide range of wines, from sweet Monbazillacs to dry whites and reds. You will taste the most highly awarded wine in the region, winner of 94 Parker points and a Gold medal in the London wine challenge. You will be quite ready for lunch next, and we have a special meal planned for you on a scenic hill overlooking the vineyards. Start off with some playful Mise en Bouche and continue with a tasting menu with dishes like roast scallops with confit lemon and sesame oil; duck confit with figs; the most amazing, succulent steak you have tasted in your life; red mullet in a tomato confit; and finish off with their decadent cheese chariot. Wine pairings will include top examples of local wines. Magnifique. Spend the rest of the day at our favorite organic winery in the region, Haut Garrigue. Run by South Africans descended from the mythical Irish wine geese, this is a stellar visit in Saussignac. With the friendly owners themselves, you will tour the vineyard, learn about biodynamic viticulture and about their unique vineyard share program, then sit down to a relaxed and informal tasting of their best wines. Alas, in the early evening, your driver will drop you back at your hotel or villa.